The following roadmap was released on December 24, 2013 by the Department of Defense. Unmanned systems continue to deliver new and enhanced battlefield capabilities to the warfighter. While the demand for unmanned systems continues unabated today, a number of factors will influence unmanned program development in the future. Three primary forces are driving the Department of Defense’s (DoD) approach in planning for and developing unmanned systems. 1. Combat operations in Southwest Asia have demonstrated the military utility of unmanned systems on today’s battlefields and have resulted in the expeditious integration of unmanned technologies into the joint force structure. However, the systems and technologies currently fielded to fulfill today’s urgent operational needs must be further expanded (as described in this Roadmap) and appropriately integrated into Military Department programs of record (POR) to achieve the levels of effectiveness, efficiency, affordability, commonality, interoperability, integration, and other key parameters needed to meet future operational requirements. 2. Downward economic forces will continue to constrain Military Department budgets for the foreseeable future. Achieving affordable and cost-effective technical solutions is imperative in this fiscally constrained environment. 3. The changing national security environment poses unique challenges. A strategic shift in national security to the Asia-Pacific Theater presents different operational considerations based on environment and potential adversary capabilities that may require unmanned systems to operate in anti-access/area denial (A2/AD) areas where freedom to operate is contested. 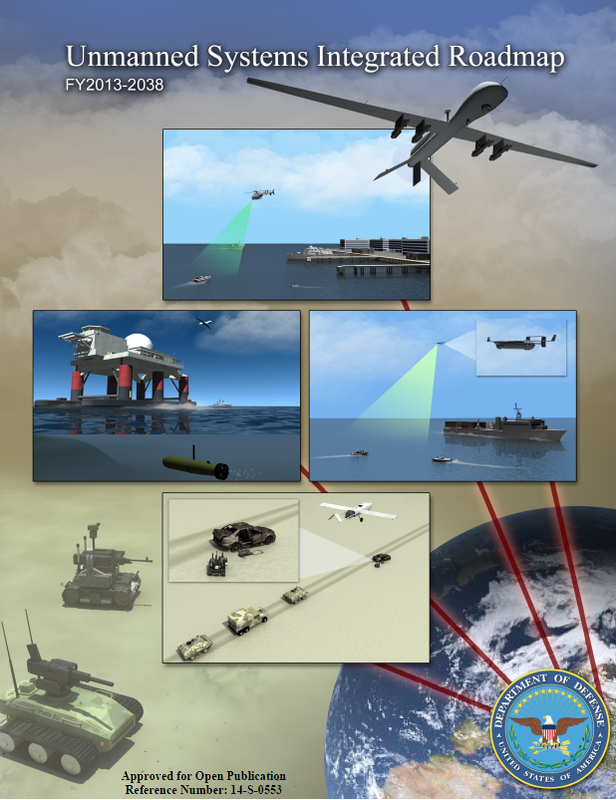 Similarly, any reallocation of unmanned assets to support other combatant commanders (CCDRs) entails its own set of unique challenges, which will likely require unmanned systems to operate in more complex environments involving weather, terrain, distance, and airspace while necessitating extensive coordination with allies and host nations. The combination of these primary forces requires further innovative technical solutions that are effective yet affordable for program development. Chapter 1: Introduction— This chapter explains the Roadmap’s purpose and scope. It examines the current unmanned environment from an inventory and budget perspective while also surveying the potential future environment. 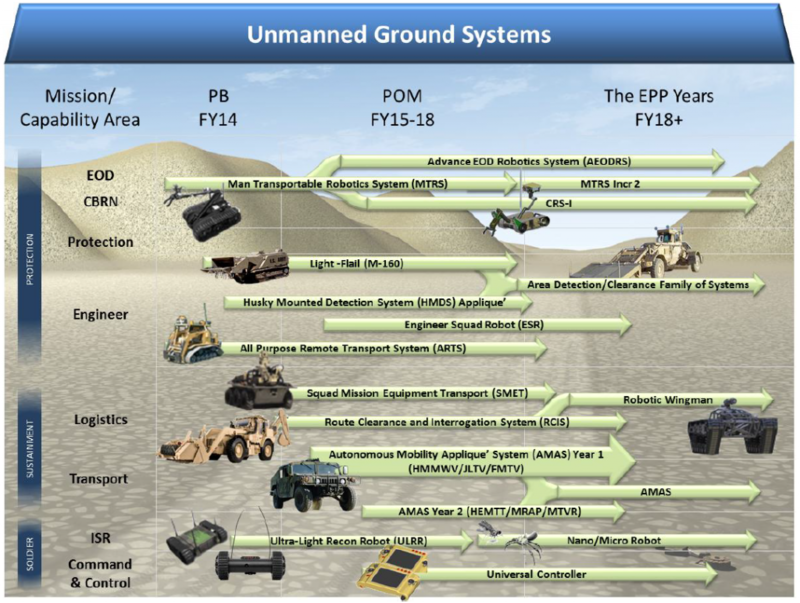 The chapter includes an operational vignette to show potential future capabilities using some of the technologies described later in this Roadmap. Also, the chapter explains the reduction in budget over the next five years beginning with the President’s Budget request for $5.6 billion in unmanned systems in Fiscal Year 2013. 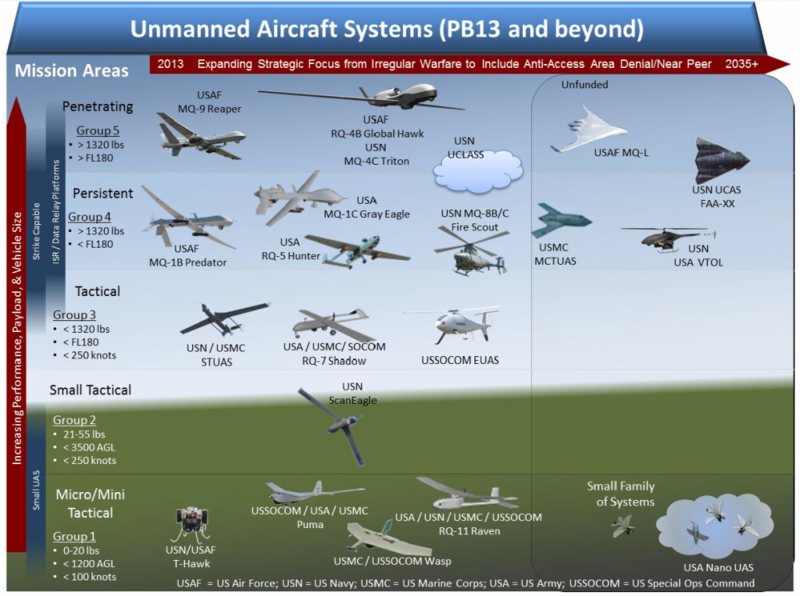 In fact, the unmanned air domain as described in the 2014 President’s Budget released to the U.S. Congress shows a 33.4% reduction in research, development, test, and evaluation and procurement funding from the previous year. Chapter 2: Strategic Planning and Policy— This chapter expounds on the structure, direction, and established guidance from DoD leadership toward planning and developing unmanned systems. It briefly discusses some of the prevailing unmanned issues of the day and expresses departmental direction in their resolution. • Provide capabilities more efficiently through such attributes as modularity, interoperability, integration with manned systems, and use of advanced technologies. • Be more effective through features such as greater automation, improved performance, and flexible use of capabilities. • Be more survivable in contested environments through improved and resilient communications, increased security from tampering, and system design. • Reduce manpower requirements to operate and support unmanned systems. Chapter 4: Technologies for Unmanned Systems— Certain key areas of interest for improving technology reflect DoD’s shift in strategic priorities and address the requirement to continue to reduce lifecycle costs across all systems, including unmanned systems. The six areas of interest highlighted in this chapter are interoperability and modularity; communication systems, spectrum, and resilience; security (research and intelligence/technology protection (RITP)); persistent resilience; autonomy and cognitive behavior; and weaponry. This chapter also describes how limited science and technology funding will potentially impact such emerging technology solutions. Chapter 5: Operating Environment — This chapter describes the operating environments of unmanned systems, which are critical in determining system performance flexibilities (e.g., appropriate levels of automation, maneuverability, communication options) needed to accomplish the mission. The chapter emphasizes that every aspect of the operating environment, including the physical and regulatory, should be incorporated in all acquisition lifecycle stages. Guidance is currently available from each Military Department although requirements and standards must still be developed to support new capabilities. Chapter 6: Logistics and Sustainment — The rapid development and fielding of large numbers and types of unmanned systems present DoD with a significant sustainment challenge. This chapter discusses the necessary transition from supporting immediate warfighter capability requirements to creating an affordable, long-term sustainment environment utilizing a flexible blend of original equipment manufacturers (OEM), other contractors, and organic support to meet logistics support objectives. Chapter 7: Training —The current state and forces shaping the training environment are similar to those that have shaped the logistics environment. As DoD transitions to a peacetime environment, the proper mix among the live, virtual, and constructive domains must be put into place to ensure that the asymmetric advantages offered by unmanned systems can be employed in future operations and at a reduced cost. This chapter describes the current state of training for unmanned systems, related challenges, and the way ahead. Chapter 8: International Cooperation — This chapter reflects DoD’s efforts to include cooperative research, development, test and evaluation, and regulatory/standard agreements of defense technologies and systems with foreign partners as well as the procurement of defense articles, systems, and services from foreign partners. DoD objectives and methods are explained. 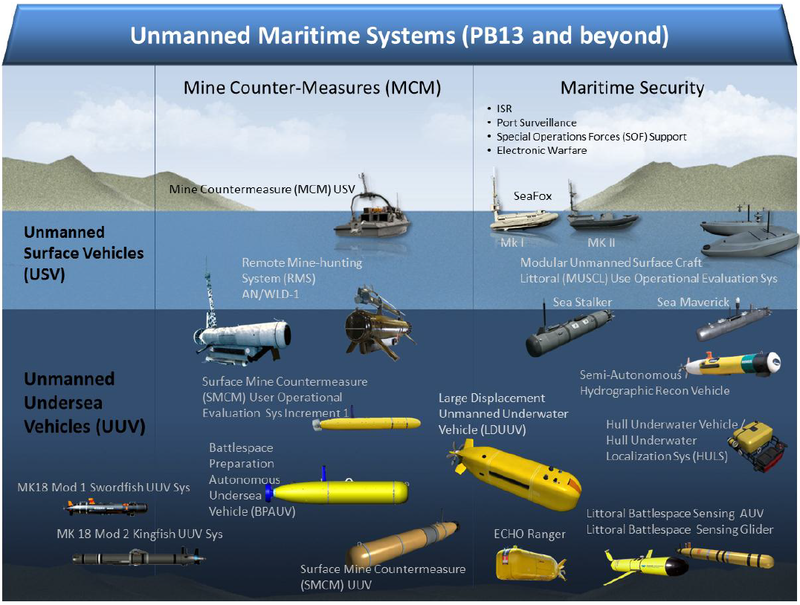 While DoD unmanned systems development funding will likely be constrained over the early part of this decade, unmanned systems (air, maritime, and ground) continue to hold much promise for the warfighting tasks ahead. If the technical, logistics and sustainment, training, and cooperation challenges are addressed by accomplishing the projects and tasks described in this Roadmap, advances in capability and affordability can readily address the needs dictated by the plans, policies, and operating environments. These advances will achieve well beyond what is attainable today.